Put a Ring on It! 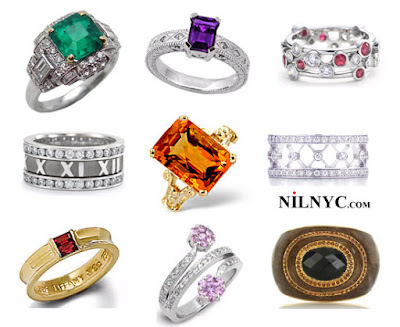 Here are you are seeing some nice stylish rings, all for my taste! Buying a diamond or gemstone ring should be a delightful experience but it should also be an informed decision. It's a process of making choices: the right choices. Just as you decide on a dress or a suit according to your personal style, your figure and where it fits into your wardrobe, when you shop online for a ring, you should be thinking about your hand shape and your personal sense of style. Part of that sense of style centers around the way you plan to wear the ring. All of these ingredients add up to a finding the right ring for you. Even before you look at ring styles, take a minute to think about the shape of your hand and your fingers. Is your hand long or wide? Are your fingers rounded or thin? Do your fingers taper or are they even in width? These elements will affect the way a ring looks on your hand. You already know that that red dress with the broad stripes doesn't do nearly as much for your figure as the slenderizing black sheath with the flattering neckline. Let's consider your hand shape. The basic rule couldn't be simpler: width adds width, length adds length. So, if you want to diminish the width of your hand, look at rings with an elongated design. Look for marquise or oval cut solitaires that pull the eye along the length of the finger. A pear shape could work too, if it's quite a slender pear, with a narrow rounded top, tapering to a point. Remember, not all pears are the same! There are plump pear shapes and skinny ones, as well as those that conform to the ideal proportions for this shape. But ideal for a gemstone is not necessarily ideal for you. When you're buying a diamond or gemstone to wear, rather than as an investment, a stone that doesn't fit the ideal proportions may be just perfect for your hand, whether it is too wide or too narrow to meet that ideal. An emerald or rectangular cut may also be a good choice, provided the stone has slender proportions. Rings have three dimensions, however, so consider the height of the style as well as its width and length. A layered setting, involving tiers of stones can be effective if the setting is asymmetrical. The eye will follow the flow of the design and register length. 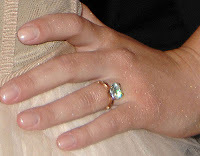 For the slender finger, look for the plump pear shape, or an oval or marquise stone set across the width of the finger. You will also find the brilliant or round diamond to be a good choice, especially if it is in a setting with an interesting shank that draws the eye across the finger. The slender finger is a good showcase for a setting with height, one that places the stone somewhat above the finger and draws the eye away from the finger itself. The overall size of your hand should be taken into consideration as well as the shape of your hand and fingers. Choose a design that is in proportion to your hand. A woman with a big hand can carry off a big, multi-level ring far better than a woman with a small hand. When you're shopping for a ring set with more than one stone, the setting becomes the principal factor in determining the overall shape. Here, the choice is as varied as there are designers. There are cluster rings with the stones arranged like a flower; there are open-work lattice rings in which diamonds flow along the lines of the setting; there are ballerina rings in which baguettes are set in an undulating curve that emulates the tutu skirt of a dancer. Sarah Jessica Parker's ring looks really precious.. I'm sure its a very expensive one..
happy mother's day to you victoria, you're a fit and chic mom. Very nice website, loved it..
Anne, you're my number one! Paris, I don't like you at all cause you're so fake, try to be realistic! Kathryn's ring more stylish than others. WOW! Beautiful rings I must say. I am always curious to know that what jewellery celebrities actually like to wear. I really liked the rings displayed above. They are so unique and stylish. Just love the collection! © Copyright 2019 NILNYC.com All Rights Reserved. Powered by Blogger.